Marx talked famously of history repeating itself as farce. However, even he might have found it hard to envisage the pantomime that the British ruling class now finds itself performing. Having barely scraped through an election in June 2017 promising “strong and stable government”, Theresa May’s government looks today more like the slapstick clowns of the silent movie days, dodging custard pies and slipping on banana skins. In the 18 months since that election, so far 32 government ministers have resigned, including a Deputy Prime Minister, two successive Secretaries of State for Exiting the EU, two Northern Ireland Secretaries, the Secretaries of State for Foreign Affairs, Home Affairs, Defence, International Development, Education, Transport, Work and Pensions, to say nothing of a host of lesser mandarins, leaving several more openly “considering their positions”. 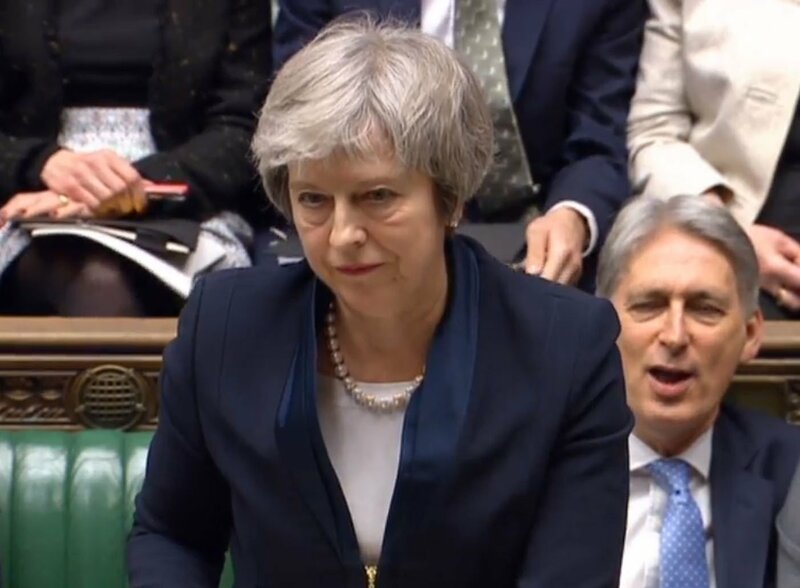 Within the last week or so, May only barely survived votes of confidence from her own parliamentary party and from parliament as a whole, while the proposed deal with the EU that she had negotiated over the course of two years was humiliatingly rejected in parliament by a colossal 432 votes to 202 – a resounding and historically unprecedented government defeat. And today, having been ordered by parliament to come up with an alternative proposal, what is her new plan? Why, to hold still more discussions with the ultra-Tory DUP [the Democratic Unionist Party – a right wing, Protestant sectarian party in Northern Ireland] on the same deal which they have already rejected, prior to returning to the EU to beg for concessions which they have already refused. How does British capitalism find itself in this mess? It was historically the first in the world to overthrow a feudal monarchy and chop off the head of a king; the first to industrialise, making Britain “the workshop of the world”; a global power that once ruled the biggest empire in history. Half a century ago a former US Secretary of State remarked that Britain had “lost an empire but not yet found a role”; that is a thousand times truer today. By the 1980s, Margaret Thatcher deliberately destroyed all but the last remnants of Britain’s flagging industrial strength in a desperate bid to curb the power of the trade unions, leaving the British economy to the mercy of its most predatory and parasitic sectors: finance and property, launderers of black money sucked in from the world’s oligarchs, hiding their profits in offshore tax havens. All that sustains the political authority of this increasingly dominant wing of the ruling class is its exploitation of the vile imperial heritage of jingoistic chauvinism to siphon the discontent of its millions of suffering victims into a xenophobic revolt against the EU. This faction of the Tory party is salivating at the prospect of a decisive break with the EU, tearing up whatever limited safeguards it had imposed against “unfair competition”, and opening the floodgates to unregulated trade deals with the USA, including outright privatisation of the National Health Service. Another, based in the declining manufacturing sector, is desperate to preserve the lucrative continental markets and ready supply of cheap labour afforded by a “soft” Brexit, if not continued EU membership. Tory Britain is fast running out of options. Some are pushing for a “Norway plus” deal – accepting all the rules of the EU while forgoing any share in formulating them; others, for the thermonuclear option: a “no deal” Brexit which would plunge Britain into catastrophe. Looming ahead is the growing likelihood that this joke of a government will at last fall to pieces. Not for the first time, the British establishment is finding it hard to shake off the demons of its past crimes in Ireland. After thirty years of civil war, the last wave of “troubles” in the North was only brought to an end in the context of both countries’ common membership of the European Union, which opened up the border and facilitated the acknowledgement of an “Irish dimension”. Without a continued customs union (which May has ruled out, but Corbyn favours), the erection once again of a hard border threatens to conjure up once again the ghost of past conflicts. It is ironic that England could end up losing not just its last corner of Ireland, but Scotland too, which voted overwhelmingly against Brexit. 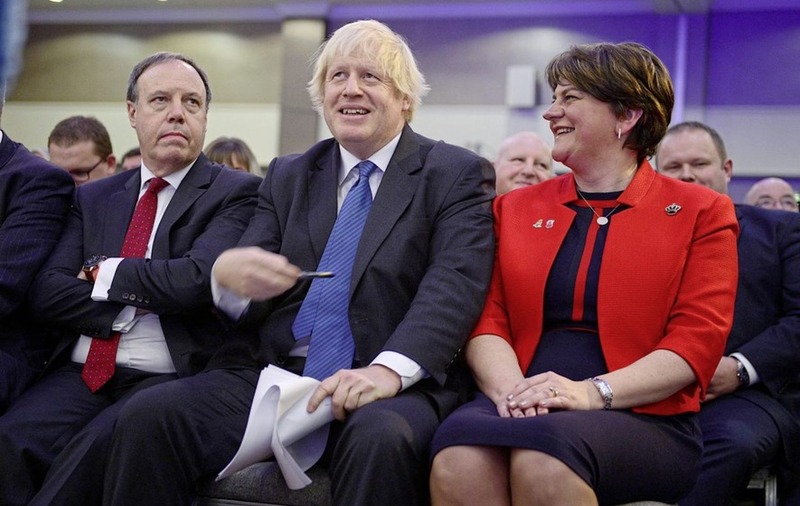 May’s Deputy Leader Nigel Dodds, former cabinet member and possible future British Donald Trump, Boris Johnson and DUP leader Arlene Foster. Bast leaders of British imperialism would be horrified that their class is being led by a caste of characters like these. Jeremy Corbyn is resisting pressure from the Blairites, yesterday’s displaced establishment, to hold out for a so-called “people’s vote” – a second referendum, in the desperate gamble that it might with luck result in a different outcome this time, a restoration of the failed status quo, and ignoring the furious backlash that it would provoke. He rightly insists that the real divide in Britain is not between the Leavers and Remainers, but between the many and the few. What matters is the fight to protect and enhance workers’ rights and living standards. Never again must a Labour government bow down to the dictates of the ruling class, whether from Brussels, Washington or the City of London. Roger Silverman wrote a piece on the historical background to Brexit, which readers can find here. 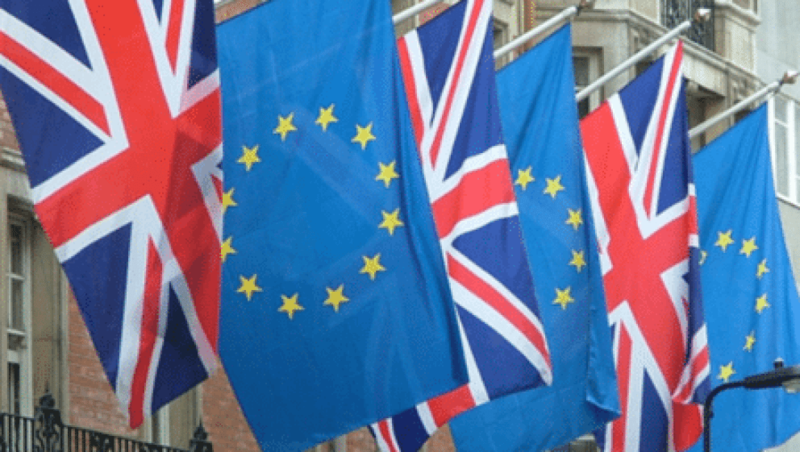 We have carried a whole series of articles on Brexit, including several that oppose those on the left who support Brexit. These articles can be found here.